Barry Allen is used to investigating unusual crime scenes - both as a CSI for the Central City Police Department and as The Flash. Yet even by Barry's standards The Batcave is an unusual locale and The Reverse Flash is no ordinary murder victim. With the assistance of an injured Bruce Wayne, Barry must piece together what few clues he can about the murder of his greatest enemy before taking a trip back in time to see the murder take place! This second chapter of The Button proves stronger than the first. This is not to say the first part was bad but it was, for the most part, an extended action sequence more concerned with set-up than content. This issue offers us mysteriy aplenty and there is much for those amateur sleuths among the readers to consider. 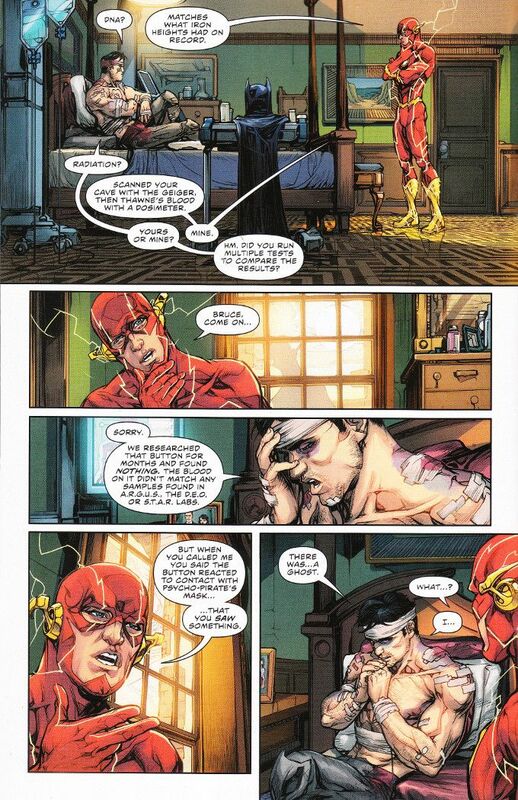 The high-point of Joshua Williamson's script, however, is the interplay between Bruce and Barry. Strangely enough we don't get to see these two heroes team up in an intellectual capacity often and it's oddly compelling to see them talking shop. Howard Porter's artwork, well-progressed past the excesses of his more elastic work on the 1990's JLA title, looks fantastic throughout, with Hi-Fi's colors providing the perfect finishes. Final Analysis: 9 out of 10. Flawed only in that there's very little progress on the actual plot, but the great character writing and artwork makes up for it.